Lightly oil the grill rack and heat the grill to medium. Grill the hot dogs for 10 minutes or until hot. Place the hot dogs into the buns. Place 1 pickle spear on one side and 2 tomato wedges on the other side of each hot dog in the bun. 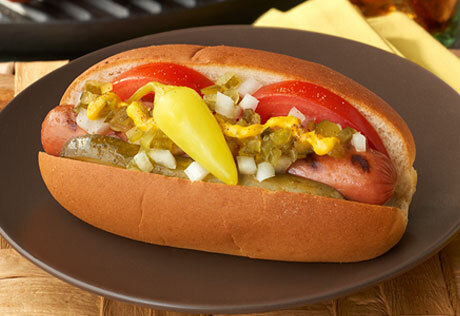 Top each hot dog with 1 tablespoon onion, 1 tablespoon relish, 1 teaspoon mustard and 1 sport pepper. Sprinkle with the celery salt.